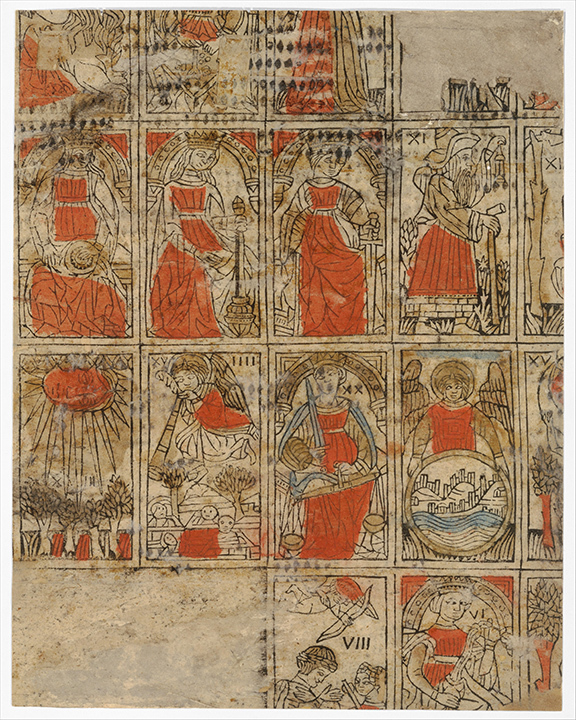 This is a recreation of the oldest known popular printed Tarot deck, created in Italy in the 1400s. For now, my version of this deck only exists as an art edition of the Fool and 21 trumps, printed on archival cotton rag paper, hand cut, and with a hand made portfolio case. With the case, it measures four and three quarters inches by two and a quarter inches, the same as the original. The decks are individually made when they are ordered. Allow four weeks for delivery. One of my art editions of this deck is included in the collection of the Metropolitan Museum of Art, in New York. It is $200 plus $8 shipping in the US or $35 international. I also make a full 78 card art edition facsimile of the entire deck in a hand made box for $600 plus shipping. A copy of the full deck is also included in the Metropolitan Museum of art’s collection. My desire to create a facsimile of an early popular Tarot deck stemmed from a fascination with the enigmatic images of the Tarot, from a desire to know what the artists who first created these images in the fifteenth century were trying to express. and what was the experience of the common men and women who played with these cards. Most of the earliest existing Tarots are expensive hand-painted and gilt cards that were created for wealthy nobles. In the case of the Visconti-Sforza Tarocchi, we may have a complete set of trumps, created for the Duke of Milan, dating from as early as 1450. These cards exist, however, precisely because they are valuable miniature works of art and unlikely to have been used for game playing. Common sense indicates that the majority of Tarot decks that were actually used by middle and lower class gamblers were inexpensive printed decks and, because of their ephemeral nature, examples are harder to find. 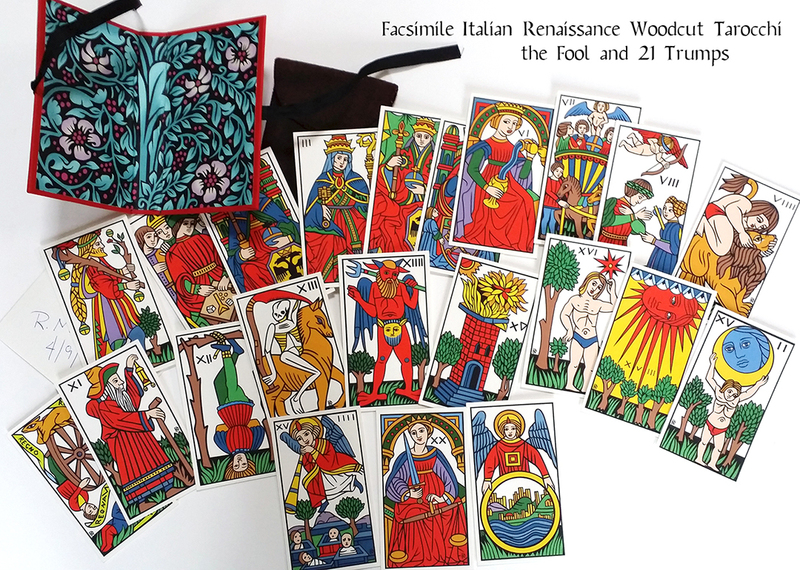 Yet, it is these decks that represent the true popular tradition and my facsimile of the Renaissance Woodcut Tarocchi is an attempt to recreate the Tarot as it was known to the common people of that era. I developed this facsimile over many years, primarily, from sheets of Italian woodcut Tarocchi cards, which are uncut and contain many cards on one sheet. The sheets are form more then one deck but executed in a common style and estimated to date from 1465 to about 1550. Twenty of these are now located in the Budapest Museum of Fine Arts, Hungary, three are in the Metropolitan Museum of Art, New York, three fragmented sheets are in the Yale University Library, Connecticut, seven individual cards are in the private collection of Theodore B. Donson, New York, and one fragmented sheet is in the collection of Silvio Berardi, Bologna. Photos of these sheets can be seen in volumes I and II of Stuart Kaplan’s Encylopedia of Tarot (1978, 1986) and in G. Berti and A. Vitali’s Tarocchi Arte e Magia (1994). The image below is of one of the sheets in the Met. These sheets are rare examples of the type of ephemeral decks that were in common use in Ferrara in the fifteenth and sixteenth centuries. The sheets are not all printed from the same series of woodblocks but they are stylistically linked and the order of the trumps, as indicated by the numbering on the prints, follows historian Michael Dummett’s order B, which suggests that they all stem from Ferrara. For example, on the Justice card we find the penultimate number, twenty as we should in order B. Many of these sheets still exist only because they were recycled as part of the cardboard filler inside the leather covers of books from the period. The sheets consist of black lines printed from a woodcut block and are partially colored with flat watercolor paint applied through stencils with a stippling brush. The colors are incomplete and out of register and many have faded to less festive grays. Fortunately, the combined extant sheets provide images of the Fool and all twenty-one trumps that are now considered standard. Several, however, are only partially preserved because the sheet was cut through the image or they are indistinct because parts of the wood block chipped before the print was made. Only the right half of the Chariot, and the Emperor exist; only the upper half of the Lovers, Temperance, and the Star exists; and Strength is missing the upper left quarter. These gaps in the imagery have, until now, presented an insurmountable problem for anyone wanting to reproduce the deck. It is only through careful consideration of what the visible lines suggest within their stylistic convention and a comparison of these prints to contemporary hand-painted cards from Ferrara that a complete facsimile deck could be completed. A notable feature of this deck is the Hermit, whose Ferrarese title Gobo means hunchback and although he is depicted with a hump he may be the oldest Tarot card to show this figure as a Christian ascetic holding a lantern instead of a figure representing time as in the Visconti-Sforza deck. The Devil and the Tower from this deck are again among the oldest representations of these trumps. The Magician or Juggler, called Bagatella in Italian, besides being depicted with dice and gambling tools, holds a hammer for removing teeth, indicating that he was also a traveling dentist. As in the Visconti-Sforza deck Strength depicts a male hero instead of an allegorical female wrestling a lion; but unlike the Visconti-Sforza card, which depicts Hercules, this figure is beardless and has long hair suggesting, instead, that it may be a figure of the biblical hero Samson. This card is known only through fragments of the right half on one sheet and the lower half of the left side on another sheet, so I determined the hero’s position on the back of the lion from the location of the tip of his knee, which is visible on the second fragment. Also the Sun card is notable for its unique and sensual stylization. I am interested in getting the whole deck. Also I want to purchase your other decks but it appears you can only buy one at a time forcing you to pay $7 in shipping for each deck. Do you have a solution. Yes, I can combine the shipping. Just tell me what you want to order and I can send you a PayPal invoice for the correct amount.